I’ve never been much of a fan of short stories. I can admire the skill needed to create compelling characters, evoke a sense of place and tell a well rounded story all within a few thousand words. But when I read a short story I always get to the end feeling I’ve been short changed; that I’m just getting into it only to find myself adrift. But two recent collections have shown that maybe the problem is that I just hadn’t found the right author. I ordered The Redemption of Galen Pike by Carys Davies having seen Simon’s announcement at SavidgeReads that she had won a 2015 Jerwood Fiction Uncovered Award. Reading his review it was clear this was no ordinary short story collection. I then discovered Carys Davies comes from my home country of Wales. We have so few good contemporary authors that I wanted to show my support. I must have been in a fog at the time because I didn’t even twig that this was a collection of short stories. Having now read it I can only concur with one of the Jerwood judges who called this collection ‘stunning’. It’s a slim book of 17 stories one of which Nothing Like My Nightmare is essentially a paragraph; a complete story told in 186 words by an unnamed narrator (a parent I surmise) reflecting on all the things that could go wrong as the daughter embarks on a flight overseas. Without spoiling the effect I’ll just say that the final sentence caught me so unawares I gasped. The other stories, many of which have won prizes or been shortlisted in competitions, show the infinite variety of Carys Davies’ use of the short story form. They vary wildly in location from the wilds of Siberia to a remote farm in the Australian outback and a prison in a small Oklahoma community. It’s hard to determine exactly the time period in which some of the stories are set — the only clue in Precious, for example, a story about a foolish, idolised middle aged man who falls for his young cleaner, comes early on when he describes arriving at an apartment dragging his wheeled suitcase. Many of these stories convey a impression of the vulnerability experienced by individual members of the human race and their consequent desire to connect with a fellow creature. In the title story, the connection is motivated by the desire of a Quaker spinster to bring comfort to a condemned prisoner and persuade him to cleanse his soul before death. When he rejects her overtures she simply sits with him in compatible silence waiting for the moment when he feels ready to talk. In another story, a woman reluctantly lets a neighbour into her home while her husband is away, believing him to be obnoxious only to discover they endure the same painful secret. Vulnerability isn’t confined to ordinary people in Carys Davies’ world. She delivers a delightful story of a man’s daring attempt to rescue the widowed Queen Victoria from yet another desperately dull official event by relating a story about his wife’s infidelity. Another, rather poignant, tale brings us Charlotte Bronte purchasing a new hat before a meeting with the publisher to whom she’s rather taken a shine. These are stories that are hard to resist reading in one sitting. But they are best savoured in small doses, the more fully to enable the resonance of each to linger. 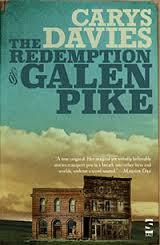 The Redemption of Galen Pike by Carys Davies is published in the UK by Salt Publishing. You can read the title story at Prospect Magazine here but I urge you not to stop at this one story. Go and buy the book. Posted on July 18, 2015, in Jerwood Fiction Uncovered, Short stories, Welsh authors and tagged Carys Davies, Jerwood Fiction Uncovered, Salt Publishing. Bookmark the permalink. 16 Comments. I’ve read and enjoyed Bonnet before – it was in a collection called Red Room: New Short Stories Inspired by the Brontës – but I look forward to reading the others. Thanks for recommending this collection as one to read. I am with you on short stories. I get that “is that it” feeling at the end of most of them. Of late though, I am starting to appreciate the literary value of some of them. Sold! I’m not normally a short story fan, but this collection sounds a little different. This sounds like a wonderful collection, thank you for sharing. As a short story collection fan I am pleased to hear this may have changed your mind about them. Like Ali, I’m a fan of short stories, and these do sound very good indeed. The variety of characters and locations appeals to me too. I love short stories and these do sound brilliant.